Morocco Tuesday sought to downplay as football hooliganism the death last weekend of seven people, including two policemen, in clashes at the end of a soccer match between local residents of the West Saharan port city of Dakhla and migrants from the north of the country. 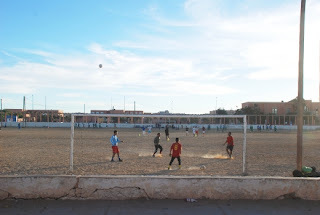 Some 20 people were reported to have been wounded in the clashes in what the state-owned news agency MAP said was a fight between rival supporters of local club Mououdia Dakhla and Casablanca’s Chebab Mohammedia . The clashes, the worst in a year, reflected tension between the local population, many of whom see the migrants as an attempt by the Moroccan government to change the mineral-rich Western Sahara’s demography in a bid to prevent the region from voting for independence in an eventual referendum. Morocco and the Algerian-backed Saharan independence movement Polisario Front fought a 25 year-long war that ended in 1991 with a United Nations-brokered ceasefire. US efforts to reach an agreement on the terms of a referendum stalled this summer with Polisario rejecting a Moroccan offer of far-reaching autonomy and demanding a referendum on independence instead. The Western Sahara, a sparsely populated tract of desert about the size of Britain, was annexed by Morocco in 1975 after Spain’s withdrawal from the territory. Morocco has since moved people from the north of the country into the region. Dakhla lies 1,830 kilometers southwest of the Moroccan capital of Rabat. The clashes erupted Sunday with youths throwing stones. They escalated as Sahrawi activists joined the fighting, local residents said. The residents said the violence continued on Monday. They said that police used teargas to restore calm and that troops had been deployed in two of Dakhla’s neighborhoods. Moroccan Interior Minister Taieb Cherkaoui visited Dakhla a day after the violence ordered an inquiry to determine who was responsible for the violence. Local authorities issued a statement saying that cars and businesses had been set on fire. “The security situation is under control and an inquiry by police detectives is under way to arrest people involved in these actions in order to bring them to trial," a statement by the Oued-Eddahab-Lagouira province said. It charged that “criminals” had exploited the soccer riot to attack people with clubs and knives. The soccer riots were the latest in a series of incidents between locals and migrants. Northerners attacked in February members of local population. 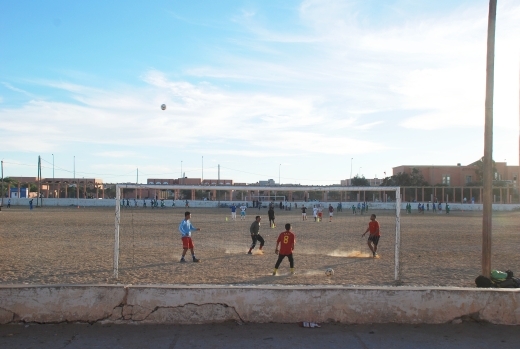 The Saharan town of Laayoune witnessed last November deadly riots when police sought to break up a protest camp housing thousands of local residents demanding better living conditions. Moroccan Communication Minister Khalid Naciri likened the violence to "hooliganism that can happen anywhere around the world.” He charged in a telephone call with Reuters that “some people may be seeking to take advantage of these riots to spread instability ... We don't expect enemies of unity to sit idle." The soccer riots erupted as thousands participated in the largest anti-government protest in months in Casablanca, Morocco’s largest city, and a smaller demonstration in Rabat, threatening to boycott the upcoming elections. In a symbolic retaking of territory, the 10,000 protesters marched through the sprawling lower income neighborhood of Sbata, where in May pro-democracy demonstrators were attacked and beaten by police. “Will you vote?” chanted a protest leader. “No!” roared back the demonstrators, The Associated Press reported. The protesters – youth activists, Islamists and leftists – are critical of a new constitution passed in July in a bid to save Morocco the kind of turmoil other Arab nations are experiencing as a result of the wave of anti-government protests sweeping the Middle East and North Africa. The protesters fear that the constitution will not lead to improved services or put an end to corruption and nepotism. The criticism is further rooted in the fact that the constitutional changes were drafted by a commission appointed by the king. An overwhelming majority of Moroccans voted in a referendum in July in favor of the new constitution but for many feel that the changes don’t go far enough in meeting protesters’ demands for greater political freedom and enhanced economic opportunity. King Mohammed VI of Morocco, like King Abdullah of Jordan, is one of the few Arab leaders to enjoy popular support. Demonstrators have granted him the benefit of the doubt in the hope and expectation that he will meet their demands. The new constitution invests unprecedented power in a civilian, democratically elected government. However liberalization of autocratic culture is gradual and the constitution maintains the king as ruler with more than just ceremonial power. The king also retains control of the military and remains Morocco’s supreme religious leader under a constitution that guarantees freedom of religion but reaffirms the Islamic character of the state. The right to criticize the king remains curtailed while he effectively continues to control all major government decisions.